Planning for a new greenhouse is one of the most important steps a grower will have to take. Proper site selection and location with relation to markets, labor, utilities and future expansion make the difference in how profitable the business becomes. Crops to be grown - Bedding plants, potted plants, vegetables, perennials, herbs, etc. Growing period - year-round or seasonal. Plants to be grown in - pots, flats, beds, hydroponic troughs, etc. Growing media - soil, soilless mix, nutrient solution, compost, etc. Annual production - How much growing space is needed? Marketing system - wholesale, retail or both. Investment capital available - $. Although a greenhouse can be built on almost any site, some sites offer major advantages over others. Adequate land - A minimum of 2 acres is needed to allow for facilities, outdoor growing area, access, parking and buffers. Availability of additional vacant land adjacent to the site is desirable for expansion as the business grows. Soil type should provide good drainage. Regulations - Greenhouse operations can only be located in certain zones. Frontage, side yard distances, signs and the number of parking spaces are frequently specified. A check with the zoning enforcement officer should be one of the first steps taken. At the same time inquire about building codes to see whether a permit is needed. Federal, state and local regulations will influence what can be done and how long it takes to get approval. Zoning, building and wetlands regulations should be checked before selecting a site. Highway Access - Location with respect to highways should also be considered. For a retail operation, a location on a high traffic count road or near a large residential area can increase business. For a wholesale business, access to an interstate highway is desirable to handle heavy truck traffic. Topography - A site that has a gentle slope to the south increases solar gain and provides drainage of rain and runoff. A fairly level site with a 1% - 2% slope reduces site preparation costs. Orientation - Good solar access is needed throughout the day and year to get enough light energy for photosynthesis. Shelter belts to the north can provide wind protection and energy conservation. Water - The amount of water needed depends on many factors including climate, irrigation system used and crops grown. Water supply should be adequate to meet peak load demands. Generally, a supply of 0.3 gallons/day/sq ft of growing space is adequate. Tests should be conducted to evaluate water quality for suspended sediments, pH, electrical conductivity, total dissolved solids, alkalinity and hardness. All water from natural sources contains some impurities. Some of these adversely affect plant growth. Water quality tests should be made by a testing laboratory. Utilities - The cost of providing electricity and telephone to the site should be considered. Where extensive greenhouse operations are to be installed, the type and availability of fuel may be a concern. Expansion - All through the planning process, provisions should be made for expansion. What will the operation look like in five or ten years? Land should be available for additional greenhouses and parking. Water, electrical and environment control systems should be installed with expansion in mind. Labor supply - Additional labor, full or part time, may be needed as the business grows. The location can influence the size of the labor pool form which it can draw and the type of skills local employees may possess. Facilities Master Plan - A master plan provides a framework for orderly construction of the buildings and should be based on a sound business plan. The plan starts with a survey of any existing facilities, evaluates the benefits and constraints of the site and establishes where new facilities should be built. A good arrangement is to plan a core area that contains the propagation and production greenhouses, headhouse, storage and parking. Outdoor production areas should be located nearby for efficient plant movement and shipping. Expansion space should be planned for all areas. It is best to do the planning on paper so that several alternatives can be evaluated. Parking and Access - Good, all weather vehicular access to the buildings and growing areas should be provided. Parking for employees and customers, convenient to the core area is desirable. An adequate number of parking spaces for retail sales may be needed to meet the zoning code. A paved surface is usually required. Other areas and driveways can be unpaved. Surface can be bank-run gravel, pea stone, crushed stone or trap rock. Driveways and parking areas should slope to provide drainage. Swales or underground piping is necessary to carry the water away from the area. Swales should be grassed and slope at least ¼"/ft. Storage - An area for storage of materials including soil mix, containers, chemicals and equipment is needed. Indoor storage for some items is desirable for easy access and protection from weather. This can be in a headhouse or separate building. An outdoor area is usually provided for growing mix. Space for an equipment storage shed with a shop for maintenance should be planned. A clear span pole building is a low-cost alternative. Outdoor Production Areas - Prime space should be allocated to plant production including growing beds, shadehouses and overwintering structures. Good light, drainage and proximity to water are needed. Production areas should be laid out in rectangular blocks of 1000 to 2000 sq ft. Within the blocks, 6' to 8' wide beds are placed adjacent to 2' wide walkways. Generally, an arrangement with shorter length walkways across the block is preferred over ones with walkways that run the length of the block. Roadways are placed between blocks to transport and maintain plants. These should be 15' to 20' wide to allow movement of trucks or tractors. Gravel or stone on the surface requires a minimum of maintenance. A key to successful production is a well designed greenhouse with good space utilization and accurate environment controls. Greenhouses can be classified as free-standing or gutter-connected.Greenhouses for commercial production can be classified as free-standing or gutter-connected. Free-standing greenhouse - A free-standing greenhouse can have a quonset (hoop), gothic or gable roof shape. The quonset is usually the least expensive and is available in widths to 34'. Gothic designs have higher light transmission and shed snow easier. Gable designs may use trusses to span a width up to 60'. The free-standing design is usually the best choice for the small grower planning on less than 10,000 sq ft of growing space. It is easy to build additional greenhouses as more space is needed. A separate growing environment can be provided in each house. 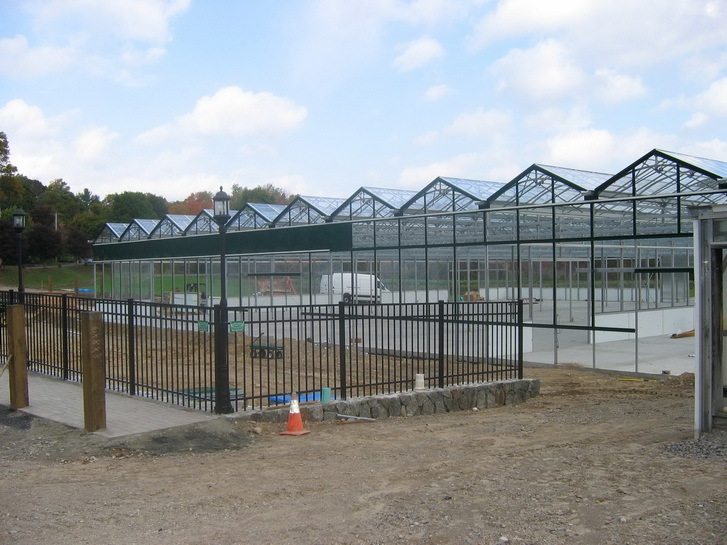 Individual greenhouses can also be shut down when not in use. They are also better suited for heavy snow areas and non-level sites. Free-standing greenhouses are less expensive to build as site preparation and erection costs are less. 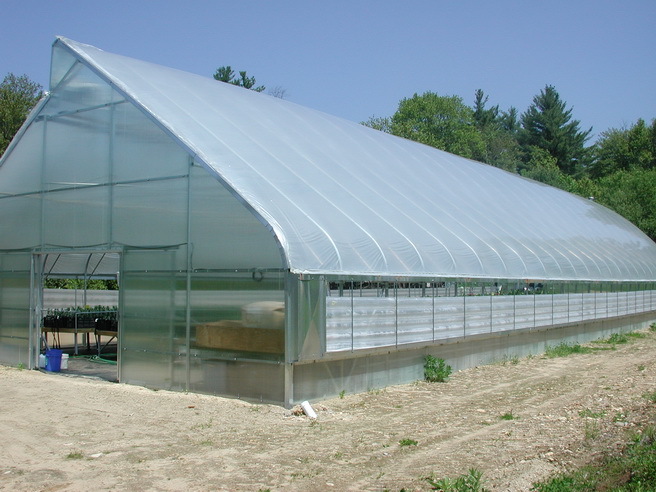 Gutter-connected greenhouse - This is a series of gable or quonset arches connected together at the gutter level. Individual bays vary from 12' to 30' in width and have a clearance of 10' to 16' at the gutter. Bays can be put together to get the width desired. Lengths up to 300' are available. A gutter-connected greenhouse offers the greatest flexibility. The vertical sides give good space utilization and a gutter height of at least 12' provides an air buffer and room for an energy truss and energy/shade screen. Gutter-connected greenhouses are usually most efficient and economical in a size of at least 10,000 sq ft. Heat can be centralized and heating costs are as much as 25% less than an equal area in free-standing greenhouses. Utilities are centralized and easier to install. Be sure to provide space for future expansion as most businesses tend to grow rapidly. Glazing - Double poly is a low-cost material with a 4-year life. Corrugated polycarbonate is a more expensive alternative with a life of 20 years. Polycarbonate and acrylic structured sheet glazing provides greater insulation but increases initial cost. Although initially more expensive, wide pane glass is the preferred glazing where high light levels are required during the winter. Energy/shade screens can help to reduce heat loss and also provide shading during the summer. Layout - A headhouse, either one section of the greenhouse or an attached building is desirable. It should contain a work area for flat filling and transplanting, receiving and shipping area, utility room, office and employee room. Build it high enough so that storage can be overhead. Adequate water, electricity and telephone should provide for an expansion phase. It is best to have concrete floors throughout the headhouse and greenhouse for cleanliness and access. Adequate drainage should be provided. Depending on the crops to be grown, production can be on the floor or on benches. Fixed peninsula benches or a movable bench system may be used to increase growing space. A system of carts or overhead trolley conveyors can be employed to reduce materials handling costs. Germination Rooms - Germination can be done on the benches in the greenhouse but it is better to have a separate room or chamber. Good heat control and a fog system can provide the ideal environment. Lighting can give the seedlings a good start once they germinate. Heat - A hot water boiler is the best choice for a heating system. Water temperature can be modulated to meet the needs of the different systems. Each greenhouse or bay should have independent temperature control for different crop needs. Hot air furnaces or unit heaters are a good choice where the greenhouse will be shut down for the winter as water systems need to be drained. Bottom heat in the floor or under the benches is important for uniform root zone temperature. Floor heat can be provided with EPDM tubing placed in a sand layer or in concrete. Bench heat can be provided with either EPDM tubing on the benches or low-output fin radiation under the benches. It is best to limit this zone of heat to no more than 25 Btu/sq ft as excessive drying of the growing mix can occur. Water temperature should not exceed 110 deg F. Root zone heat will provide only about 25% of the total greenhouse heat needs on the coldest night in northern climates. Heat exchangers or fin radiation around the perimeter and under the gutters are installed to provide the remaining heat. These should be zoned separately. Cooling - Natural ventilation depends on temperature and wind gradients to remove the heat from the greenhouse. Locating the greenhouse where it can intercept the summer breezes and providing large roof and sidewall louvers is important. A fan and louver system will give more positive ventilation. Although more expensive to operate than a natural ventilation system, it will give better temperature control. The system should be designed to give a ventilation rate of about 2 cfm/sq ft during the winter and 8 cfm/sq ft during the summer. Several stages of ventilation capacity are better than a single stage. Evaporative cooling, either fan and pad or fog may be necessary if plants will be grown during the summer. The moisture provided picks up excess heat that is exhausted by the fans. A horizontal air flow (HAF) system will give good air movement and uniform temperatures. 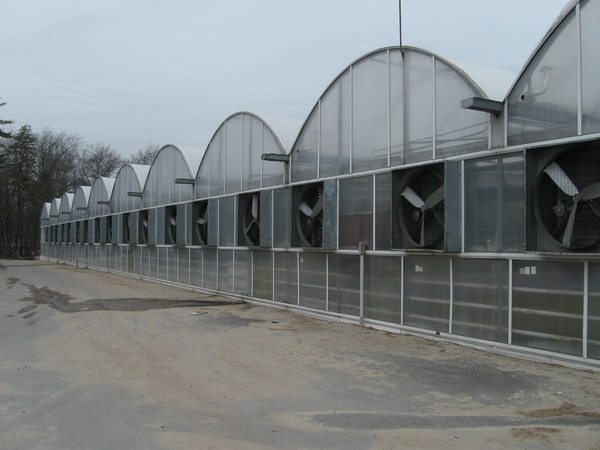 Small fans are placed to develop a horizontal pattern of air movement that mixes the air, removes moisture from leaf surfaces to reduce disease potential and increases carbon dioxide to the plants. Energy Conservation - With the high cost of fuel, installation of energy conservation measures are important to reduce production costs. Double glazing, perimeter insulation, energy/shade screens and wind breaks should be considered. Management practices, such as growing crops that require cooler temperature, purchasing plugs or prestarted plants, keeping the growing space full and the use of supplemental carbon dioxide can also help. Supplemental Lighting - To overcome variable weather conditions and still meet a production schedule, supplemental lighting may be needed, especially in the propagation area and nursery. High pressure sodium (HPS) fixtures are the most efficient and should be installed to provide at least 900 foot-candles at plant height. Controls - For small operations accurate thermostats or an electronic controller should be installed to control heating and ventilation equipment. Computer control is best for integrating the heating, cooling, lighting and other systems in larger operations. It also provides a record of the environmental factors so that timing of the crop can be repeated or adjusted. Thermostats or sensors should be located at plant height in the plant zone. Irrigation - Uniform irrigation is very important, especially for plants grown in plug trays with small cells. A computerized boom system can be programmed to water different sections of the greenhouse at different rates. These units are very versatile and eliminate most hand watering. Other systems used in greenhouses include mist for propagation areas, overhead watering for mature crops and drip for hanging baskets and crops grown in ground beds. Capillary watering mats may be best for potted plants grown on benches. Ebb and flood watering is becoming popular for bench or floor systems where uniform watering and containment of the nutrient solution is desired. Pesticide and Fertilizer Storage - Separate cabinet or shed located away from work and growing areas should be used to store pesticide and fertilizer materials. It should have heat to prevent liquids from freezing and ventilated to remove hazardous fumes. Personal protective clothing and spray equipment should be stored separately. Installation of a well controlled greenhouse will pay for itself in better quality, greater production and more uniform plants. Be sure to plan all systems for expansion. Agricultural Engineer, Natural Resources Mgt. & Engr. Dept. Greenhouse Engineering available on-line (fair-use copy) or order a hard copy from NRAES.